Thanks to its central location, you will be able to reach the major points of interest while walking through the cobbled streets of Rome. The apartment is new and well renovated with all comfort; It can host up to 4 people with a double bed in a bright bedroom and an easy-to-manage sofa in the lounge. The apartment is at the 4th floor, served with elevator! The area is populated with renowned restaurants, traditional hostaria, cocktail bars, famous ice cream parlor, trendy art galleries and boutiques, as well as rare and precious artisanal shops, local markets and of course the charming "Chiostro del Bramante"
Transfer - I can arrange a convenient transfer from both airports of Rome, on your arrival you will find a black berlin with a professional driver ready to take you home. 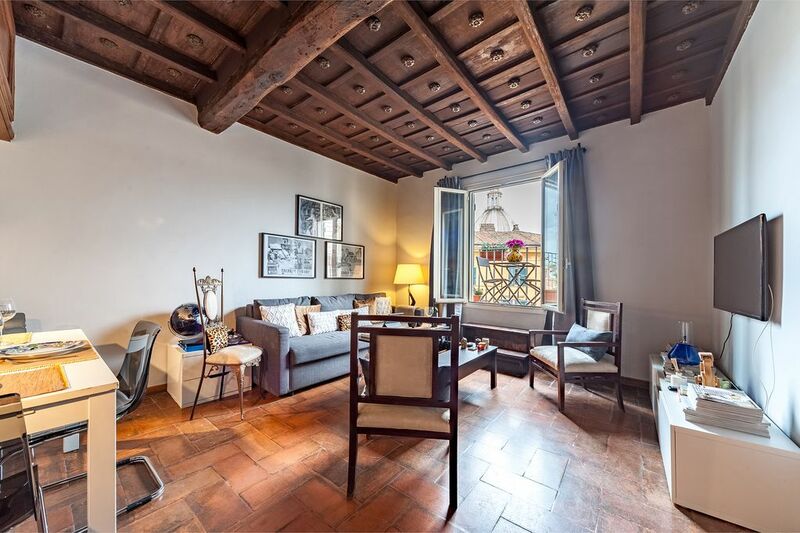 Excellent Roman flat in a great location with a terrific piazza below! Highly recommend! I walked Rome non-stop for six days (and not my first visit) so know it well, and always felt grateful to return to this neighbourhood at the end of the day. Not just central, but lovely, vibrant and full of laughter. This apartment is in the heart of it and the accommodation all one could ever want. The only minor quibble is you have to prop up multiple cushions to make the rather basic sofa comfortable for sitting. I was alone so no problem, with two you may have steal pillows from the (very comfortable) bed. I will stay here again. We loved the apartment. It was the perfect location and we loved the balcony. A few things that could be improved were the shower and a working hair dryer. We did not like how Alex, the gentlemen that let us in was trying to get $35 euro from us saying it was taxes. Thank goodness I looked at my account and saw that we paid the $35 in taxes with our payment. Everything else was excellent. Great apartment in an amazing location. We were able to walk just about everywhere. Piazza Navona was about 2-3 min walk. Apartment was pretty clean and had everything you need. Bed was very comfortable. No problem with noise as it is located on a side street. Great view! The property was very clean. The apartment is in a very good location in the city as we were able to walk everywhere to see all the major things to see in Rome. The landlord is very efficient at getting back to you when you have some questions. Also, a lot of restaurants, bars, grocery stores minutes away from the property. I would recommend renting this apartment if you ever visit Rome. Lovely flat in a wonderful position. The flat had everything we needed and Federico was very helpful. Wonderful location with scores of excellent restaurants on the doorstep and all the major sites within easy walk.